Brad was born and raised in Fresno, California which is known more for raisin production than fine wine. His father worked for a farm insurance company and he would often take Brad along with him during school holidays to visit the farmers who were his clients. Brad enjoyed the idea of the farmer’s life, but never thought he would be involved in agriculture. After finishing a Master’s Degree in Organizational Behavior in 1994, he came to the Napa Valley to work for a hotel and spa in Calistoga. At the time he aspired to manage resort hotels, but immediately fell in love with the wine business. He changed careers and started working at Mumm Napa Valley in the hospitality department. 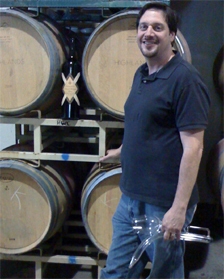 In 1996, Brad returned to Fresno to study enology at Fresno State, completing his studies in 1999. He then worked 2 years as the enologist at Benessere Vineyards in Napa Valley. He became a specialist in Sangiovese and Zinfandel. In 2001 he moved to Laird Family Estate as Assistant Winemaker. Laird Estate is a large, high-end custom-crush winery and he worked with many of the most talented winemakers in Napa Valley. In 2006 Brad left Laird and partnered with a couple who owned a Napa vineyard to start a new brand. His partners tragically abandoned the project due the financial crisis. Brad accepted a position at Silenus Vintners. He is currently the Winemaker for Silenus, Danais, and Jaeger Vineyards, as well as Highlands. Brad says, “My philosophy for winemaking is to always combine the wisdom of the past with the knowledge of the present, to create wine that is balanced, harmonious and distinctive." This he has certainly done with Highlands Wines!